If you want to rock the latest trends, you need to embrace the 70s. With this in mind, Luxe Models reveals how to pull off a jumpsuit; one of the hottest style trends doing the rounds right now. Those of you who regularly read the Luxe Models blog will know that nothing stays out of style forever. What was once new and cool does fall out of favour. However eventually some designer gets nostalgic and they update the style to turn it into the season’s newest must-have item. If you’ve been following the big spring/summer fashion weeks that recently took place in fashion capitals around the world, you’ll have noticed that the 70s are cool again. Everywhere you look designers are using 70s designs, colours and cuts to impart a touch of disco to their creations, which is why the jumpsuit has come roaring back into style. 1) Think about size: This is vital when you’re buying any piece of clothing, but it’s especially important when you’re buying a jumpsuit. If you buy the wrong fit or size, it just won’t look right on your body! 2) Avoid patterns: It’s best to wear block-colour jumpsuits. This is because patterned jumpsuits, especially ones boasting loud, large prints, are extremely overpowering and detach from the simple, clean look a jumpsuit is supposed to convey. 3) Lightly accessorise: You shouldn’t opt for patterns but there’s nothing to suggest you can’t jazz up a jumpsuit with some accessories. Just keep it simple. We’d suggest you embrace the 70s and opt for a headscarf to really rock the look. 4) Don’t go clingy: Make sure you avoid materials such as spandex like the plague. If you wear a jumpsuit that’s made of something clingy it’ll show off all your lumps and bumps; a distinctly unflattering look! 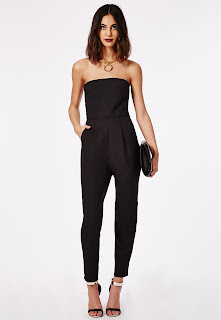 5) Air confidence: A jumpsuit makes a really, really bold statement. It’s all or nothing – if you’re anything less than 100% confident when you don this 70s fashion staple, you won’t do the look justice. You don’t have to avoid jumpsuits. The revitalised 70s trend can make you look like a million dollars. However you should make sure you tread with caution. If you don’t follow these tips when you wear a jumpsuit, you might run the risk of looking like a reject from an Abba music video! For more like this, be sure to stay in touch with Luxe Models.